Next week we’re ‘Going Green for Clatterbridge!’ From Monday 4th February we’re raising awareness (and hopefully a bit of cash!) for Clatterbridge cancer charity. The funds raised from the week-long event with go towards transforming cancer care for people across our region, by investing in their Wirral site and building a new cancer hospital in the heart of the city. Matt, Jake and the team have created a rather special green themed dessert. For every green special ordered £1 will go straight to the Clatterbridge. 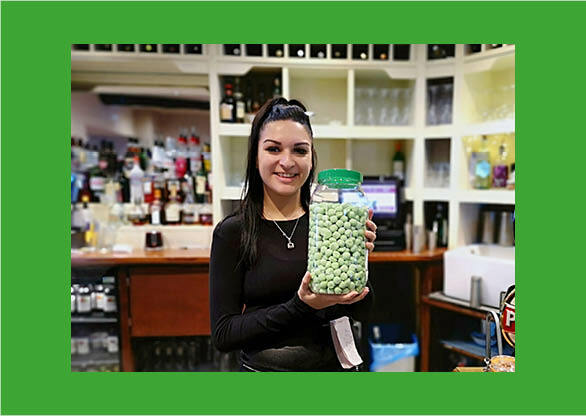 Take a guess at how many green bon-bons we have in the jar! £2 a guess and the person with the closest guess will win the jar of sweets AND a delicious meal for 2! Try your luck at balancing change on our floating lime. 20p a go and a success results in a free drink of your choice. Try it with a £1 coin and you’ll win yourself a bottle of wine! We’ll also have a change jar on the bar for donations.